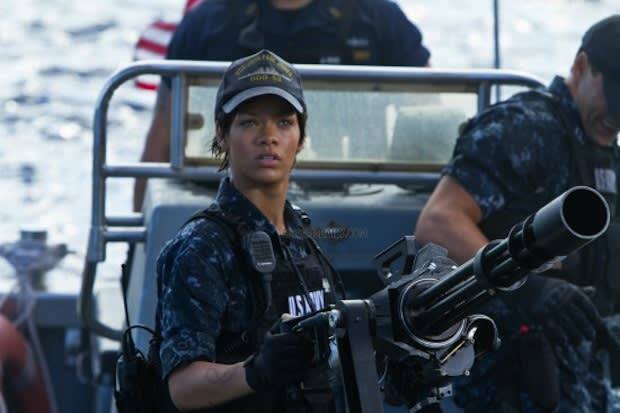 First Look: Rihanna Is Ready To Bust Her Guns In "Battleship"
If you didn&apos;t facepalm yourself into a concussion after seeing Peter Berg&apos;s Battleship trailer, consider yourself lucky. The film, which is billed as an action-packed thriller, boasted aliens, a "game board" shot, and weaponry that looked like pieces from the classic Hasbro board game. While you may or may not have seen pop princess Rihanna delivering a catchy one-liner in the clip we posted a few weeks ago, here&apos;s a new image released of the Barbados ambassador wielding (read: standing near) a boat-mounted mini-gun. It&apos;s nice to see the "Umbrella" star spreading her wings to make her film debut as Petty Officer Raikes, but the fact that she&apos;s in this movie doesn&apos;t move this to box office blockbuster status — even if badass Liam Neeson&apos;s in it. Taylor Kitsch, Brooklyn Decker, Josh Pence, Alexander Skarsgard, and the aforementioned Liam Neeson star in what is sure to be a belly flop of a film, due out May 18, 2012.